← KEEP IT SECRET? Why was that impossible? for the Very Inspiring Blogger Award. I really appreciate the honour. However, I give all the honour to the Lord because HE is the One who inspires. I consider it a great privilege to be used by Him to share the truths of His Word here. I married the most marvellous man in the world. I know some will disagree with me, and that is good because I would hope the same statement could be made by all women. I have been called a ‘Pollyanna’ person because I am a positive person. However, for the first 22 years of my life I was the opposite. I knew I was totally evil and no one would ever want me. I had no friends. ‘No one loves me: no one cares’ was my theme song. I expected the worst in life and I got it. I wanted out! “But God” – (two of my favourite words in the Bible) – but God stepped in 53 years ago and completely CHANGED me. NOW, I will admit to being somewhat of a ‘Pollyanna’ because no matter what happens, God is in control and when HE is in control, He will make EVERYTHING perfect. My life is in His hands and I am blessed. I am a perfectionist in many ways (but only as far as it concerns me. I do not expect the same of others). Everything must be EXACTLY in place. The pattern on the crockery MUST be the right way, regardless of whether it is set on the table, stacked in the cupboard, stacked before washing etc. My pegs are coloured coordinated in the peg basket and always facing the same direction. The right coloured pegs are always used for the right items. I love doing cryptic crosswords – never ordinary ones. I have completed jig saw puzzles face down, but I don’t seem to have the time in more recent years. I love the colour blue and had to force myself, a few years ago, to buy other colours, as my whole wardrobe was blue. While I was born in England and I am proud of my English heritage, I am an exceptionally patriotic, fair-dinkum, true-blue, dinky-di Aussie. While I do not like or usually use the word ‘hate’ there is one thing I consider worthy of the word. ANY form of child abuse, be it physical, sexual, mental, emotional, demeaning – anything which devalues the child in his/her own eyes – makes me see red. I am ALWAYS inspired when I visit Deb’s blog. Thank you again Debbie. A visit to Reinventing the We’ll: http://jelillie.wordpress.com/ is sure to inspire. Paulette at http://pbus1.wordpress.com/ If you want to be inspired to worship, this is the place to be. and inspiring me to praise my God and Saviour. I will show forth all Thy marvellous works. This entry was posted in Inspiration and tagged awards, Bible, Christianity, Jesus, Saviour. Bookmark the permalink. 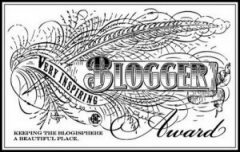 Well, you have been nominated again for the “Very Inspiring Blogger Award.” In just a few days, it will mark my third month blogging. Since then, I’ve been fortunate to have come across uplifting bloggers and their ministries such as yourself. Meeting you and reading your posts have been very rewarding to me. Angela, This is a much deserved award for you. The Lrod certainly is working in your life and using you for His glory. May the Lord continue to bless you. Thank you so much for the nomination as well. May our Lord be glorified in all things. Thank you Rob. To God be the glory for it is ALL His work. Congrats!!! God is good, I love that we get to do this!! Thank you, and yes, God IS good! Wow another Award and I have one for you too Angela my dear friend, I agree, I too like things done in order but more so with friendships, people are very important. You left out something that I respect greatly in you and that is your honesty, you share from the heart not the head, you believe in friendship 100% I know but not at the expense of honesty, I too would rather have it that way then 100 people who say what they think I want to hear but don’t mean it. Thanks for thinking of us Angela, Ron was very touched, apart from me giving him Awards your the first to do so, we all need uplifting and encouragement. You deserve it Anne. Your desire is to encourage and inspire, and you do it. Thanks Angela you too are are a great encourager, I look forward to what you share …your True Blue Mate. Thanks Ron. Your comments always encourage me. Australia is the Great South Land of the Holy Spirit and we long to see a true Holy Spirit awakening in its people. Yes The Lord longs for that too Angela and so do I and the same for Americans any any other Christians regardless of where they live that do not know His Truth. it is very True, we are not to choose to sin but as we can see below very clearly in the Scriptures that if we are Born Again we don’t only Not sin, we Can’t sin because we no longer have Adam’s seed or sinful Nature we have God’s, the old has gone the new has come and He does not choose to sin, sin or even by omission. 1John 3 : 9 No one who is Born of God will continue to sin, because God’s seed remains in him; he cannot go on sinning, because he has been Born of God. 1 John 5:18-20 We know that no one who is Born of God sins; but He who was Born of God keeps him, and the evil one does not touch him. 1 John 3: 6-8 whosoever abideth in Him sinneth not: whosoever sinneth hath not seen Him, neither known Him. Little children, let no man deceive you: he that doeth righteousness is righteous, even as He is righteous. Christian Love Always from us both -Anne.